1) How many times have you seen it? 2) How many stars (out of 10) would you give it? 3) What is your favorite part of the movie? 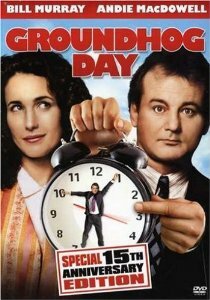 3) I love the way that Bill Murray's character transforms from a cynical self-centered guy into a man that helps others and consequentially finds what it is to love and be loved. 1) I've lost count (but not in a looooong time). 3) For me it isn't so much the destination as it is the journey. He takes the opportunity during this infinite loop to learn some pretty mundane things as memory serves, so it's not all about his perceived payoff. 3) I too love the transformation, but my favorite part is the final day (or two?) where Andi McDowell's character finally gets to know him in his "transformed" condition. 1) hard to know for sure, since I see parts of it often. Its been probably only 4 times all the way through, but many more times counting all the bits and pieces I've wathced at different times. 2) 8 stars. Its great, but maybe just a bit on the long side. 3) Bill Murray period. He's great. I love the way he goes from taking advantage of everything (knowing what everyone will do) to helping people. 3) The scene where he is pigging out and trying to convice Andi's character of his time trap by describing each unfolding event before it happens. It is his transformation that is lovely, and the questions of what time is used for. Good deeds, and art and beauty are things I desire more time to develop. I don't remember how many times I've seen it or what my favorite part is :( But I give it a 7.5. The first time I say GHD I was flying on the red eye from LA. Needless to say, I kept dozing off and waking up and saying to myself "didn't I just see this part". Got off that flight daxed and confused. It has become a movie I can watch over and over, and often I will stop in for 1/2 hour at a time. Probably have seen it six times end-to-end. Rates a solid 8 for fun, originality and watchability. I like the part that on some days he drudgingly goes through his routine (blandly answering Jeopardy questions) and other days with a true sense of purpose (like the scene grate001 mentions above). Thanks Barbara for commenting.. I was wondering if gals watched this movie.. never thought of it as a guy movie. What a great movie. I've seen it dozens of times. The idea of living the day without consequences gets you at first, but, as bill learns, the idea of having endless time to improve your life and the lives of those around you is the true allure. My favorite movie ever. I'd watch this movie ahead of any other. I've seen it 4 times now. I love it because it's just like life. We all wake up the same thing every day, and we at least wish we could be narcissists. My favorite scene might be when he's nice to the insurance salesman, and ends up saving more of his precious time, In fact, I love how precious his infinity becomes to him. He begins jealously guarding every minute, because every one of them matters to someone. I just love how bad and good this movie makes me feel. Love this movie! I've probably seen it 20+ times. I love how he wins her over by learning things about her each night. 6 years later, it's still a 10 in my book, my absolute favorite movie. I've probably seen it 4 times. It's one huge plot cheat, of course, but showing us how brutally much it takes to break down human pride is fantastic. And showing us how wonderful a human is once that pride is broken is even better. Is Healthcare a Moral Issue?